Liverpool manager Gerard Houllier insists Emile Heskey is part of his long-term plans after he was linked with a �12m move to Spurs. Spurs boss Glenn Hoddle was reportedly lining up a move for the England striker when the transfer window opens in January. 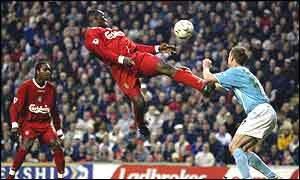 But Houllier, in an exclusive interview with BBC Sport Online, said there was "no chance" of Heskey being allowed to leave Anfield at any price. He said: "This will not happen. There is no chance of Emile being sold and there is no point in anyone asking. You can add more to that �12m figure and he will still not be leaving. "Emile is happy to be at Liverpool. He may have had a bit of a dip in his form, but I attribute that to his efforts for England during the World Cup. "Some people like to criticise Emile, but I can produce plenty of facts and figures to back up how important he is to us, and how many goals we have scored that he has been involved in. "Emile has been extremely influential and instrumental in the success we have enjoyed at Liverpool and he will continue to be. I support him and have faith in him. "He has scored important goals for us. In fact he scored our most important goal last season, the fourth one in our 4-3 win against Blackburn that put us in the Champions League - I don't forget that." Houllier added: "I believe in him and have faith in him. He will be ready to show his best form soon, I know that." Heskey, Liverpool's record �11m signing when he joined from Leicester City in 2000, has been in and out of the first team this season. And it had been reported Spurs were ready to test Liverpool with a bid, with veteran striker Teddy Sheringham out of contract at the end of the season and Les Ferdinand also set to leave.